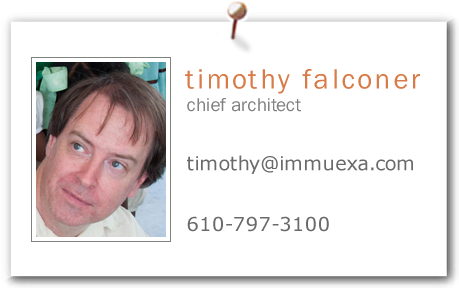 Timothy Falconer is a software developer and Lotus expatriate who worked on several of the administration features in Notes and Domino R5. He left Lotus in 1998 to start Immuexa Corporation, makers of Tidepool and Storymill, along with custom-built software and websites. He's got a degree from Lehigh rolled up somewhere in the attic, and a few decades of pizza and programming experience under his belt. He spends all his free time with his wife Paula and his daughter Isabel.